For the last three years, Connor Crabb has been working as a recreation leader at Studio One, a city-run center in Oakland that offers afterschool and summer art classes to children. The 24-year-old Oakland native starts his day at the center around 1:30 pm, going from school to school, gathering students from different sites, then riding back to Studio One with a bus driver. He coaches elementary school students in flag football and basketball, and he helps make sure they make it to their afterschool classes at the center on time. But Crabb is running out of time at the center, himself. He is one of 2,500 Temporary Part-Time (TPT) workers employed by the city of Oakland, and they are not allowed to work for more than 960 hours per year—an average of 20 hours a week. TPT workers are not offered health insurance or retirement benefits, and there is no guarantee that these employees will secure a permanent position with the city. Some of the departments with the most TPT workers include the Oakland Public Library and the Parks and Recreation Department. “All of the programs start to struggle in mid-April,” said Crabb. “Programs lose their consistency.” Crabb said this happens because workers run out of hours—workers like himself will be out of their TPT positions until July when the city’s new fiscal year begins and their hours are renewed. When a TPT worker runs out of hours, the city brings in another part-time worker to replace them. But that means summer programs and classes at Studio One will begin without Crabb, and students who are used to working with him will not see him until July. In the meantime, Crabb has a second job as a barista at a coffee shop. He also performs with his band to make extra money when he can. “I would love to see the kids in the next two months, but it’s just not possible,” Crabb said. The Service Employees International Union (SEIU) Local 1021 has been pressuring the city of Oakland to provide TPT workers with more opportunities for full-time employment and benefits. The union is currently attempting to negotiate these workers’ rights with the city. 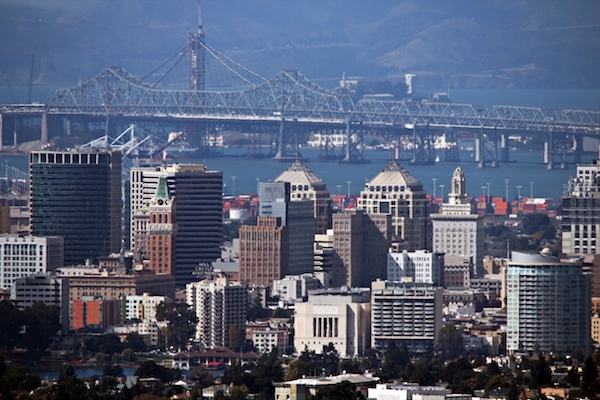 Anna Bakalis, a spokesperson for the union, said that between 2008 and 2014, the number of TPT workers in Oakland increased from 1,000 to 2,500. That number includes all TPT workers who are in the system, including seasonal employees, workers who only work a couple of hours a week, as well as those who work the maximum amount of time they are allowed to. Rebecca Kaplan, councilmember-at-large and vice mayor of Oakland, said having a high number of TPT workers creates two issues. “One, it creates hardship for the workers,” Kaplan said, because they do not receive any benefits. In some cases, she said, workers are classified as temporary for decades. “ Two, it also creates a harm to the public in terms of higher turnover and customer service,” she continued. Saving the city money has come at a heavy price for people who have been TPT workers for years. Jason Cozon, 43, has been a part-time worker for the Oakland Public Library for a little over five years. The long-time Oakland resident finds his work as a library aide rewarding, but struggles to make ends meet when his schedule can vary week-by-week. “I’ll get a call at 9:30 am to be there [at a library branch] at 10:00am. This happens once a week; sometimes it’s several times a week,” Cozon said. When work hours vary, so does his pay, so Cozon has to have a second job as handyman to get by. After years of working for the library, Cozon has no secure pathway to a permanent position. “It doesn’t seem like a good status to have us work for many years and be considered TPT workers,” he said. But despite the challenges, the Cozon is not ready to let go of a job in the city he has lived in since the 1990’s. “I prefer working for Oakland. It’s where I live and where I have my strongest community,” said Cozon. Katrina Warren, 35, is a mother of two and an Oakland resident who has been a TPT worker for the Oakland Public Library for fifteen years. “I love working with the public and I have a love for the richness of the library and the community and educational resources that we offer,” Warren said. But she feels differently than Cozon about her future with the library. Warren is now pursuing her master’s degree in social work at San Francisco State University. She picks up a shift at the library about once a month, but after years of waiting for a permanent employment opportunity with library, she lost hope of getting hired full time by the city. “Why stay in a system that doesn’t give you the opportunity to move forward?” Warren asked. Bakalis said the union believes it’s appropriate for the city to hire TPTs for summer programs. She also said that the union doesn’t think all TPTs should be made into full-time employees. But long-time use of TPT workers who keep the city running is “an abuse that needs to be rectified,” Bakalis said. Some of the departments with the most TPT workers include the Oakland Public Library and the Parks and Recreation Department. Photo courtesy of Curtis Cronn via Flickr Creative Commons.